The Golden Spoons: When Is Your Child Old Enough To Stay Home Alone? This Tuesday, my kids were out of school for Veteran's day, but that didn't mean there was no homework. After a lazy morning, my oldest began working on some science assignments and my middle daughter began working on a shadow box type of project. She decided that she needed some additional supplies that we did not have on hand, like modeling clay, so we needed to run to the craft store. My oldest, 12, asked if she could stay home alone to keep working on her assignments. I hesitated. Truthfully, they were, as usual, already arguing and I knew it would really be best to keep them separate. I also rationalized that we have been leaving her alone for over a year now for very brief periods of time (20 minutes) while I run the two younger girls to the elementary school on mornings when my hubby is out of town. I knew I could make it to the craft store and back in an hour or less and my neighbors (who also happen to be my in-laws) were home. Therefore, I agreed, gave her some final instructions, and left her with an enormous, independent smile on her face. It all turned out perfectly fine, but it felt so strange and it really got me wondering what is the "right" age to begin leaving kids home alone. I did some research and even conducted a very scientific Facebook survey by asking some other moms to share their points of view. If you are questioning this as well, here is some information that might help. Is it legal? I wondered if there were actually any laws that specified a particular age. According to the US Department of Health and Human Services (www.childwelfare.gov as of 11/12/14), there are only three states that have true laws about it. (Illinois law is age 14; Maryland says 8 years old; and Oregon says 10 years old.) Some other states offer guidelines ranging between 8-12 years old, but most don't address it at all. Is your child trustworthy? If you tell him/her not to open the door or not to go outside, can he/she be trusted to obey? How does your child react in emergency situations? If the worst case scenario came to fruition while you are away and there was a fire or a burglary, do you think your child would panic or maintain a relatively level head? 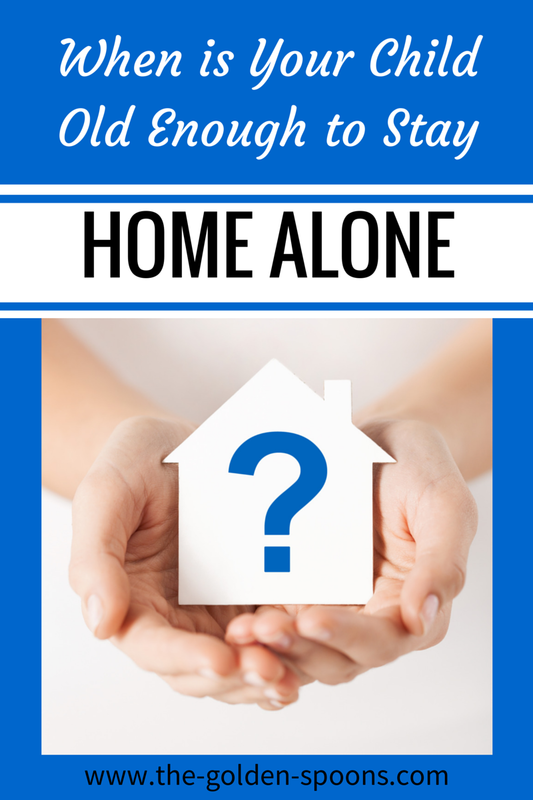 Does your child want to stay home alone? Even though you feel he/she is ready, the child may disagree and be uncomfortable being left alone. Make sure you talk with him/her beforehand. Consider your neighborhood and surroundings. As I mentioned, my in-laws live right next door and we live on a quiet street with very little traffic. This definitely helped me to feel more at ease about leaving my daughter home alone. Another mom on Facebook mentioned they live in an apartment complex, so help is just a couple steps away if needed. If you live in a more "questionable" neighborhood or in a place where it is highly likely someone will come knocking while you're gone, you might need to wait a little longer. How long will you be gone? Although the majority of moms who shared their input said children could be left alone at age 10-11, they also specified that this was for short periods of time, around an hour or just long enough to run a quick errand. Nobody was leaving children home alone all day or overnight until they were significantly older. That doesn't seem to come until closer to 15 or 16. Talk to your child! Make sure he/she feels ready to stay home alone. Talk about what to do in emergencies. Talk about what to do if someone calls or rings the doorbell when you are gone. Talk about responsibility and expectations. Set rules. Some kids may see this time without direct supervision as an opportunity to test the limits and do what is normally not allowed. Make sure you set some very specific rules and enforce consequences, if necessary. Write it down! Write down emergency numbers and alarm codes so kids can find them quickly and easily, if needed. Start small. Start by leaving your child for maybe just an hour and see how it goes. As children mature and prove themselves to be trustworthy, you will BOTH get more comfortable with the idea. Then, you can gradually increase the time and expectations. One thing I have learned in my 12 years as a mom is to trust my gut. After taking in all this information and talking to other moms as well, I feel comfortable with my decision to leave my oldest daughter home alone for brief periods of time. She's ready and she can handle it. Me? I'm getting there. Do you remember how old you were when you were allowed to stay home alone? Have you allowed your kids to stay home alone yet? At what age do you think it's acceptable? This is good info to have, Lisa. I think it really does depend on the kid. We've practiced what to do and what not to do. I think the worst thing they do is sneak candy when I'm not around. Lisa excellent post and info!!! I already weighed in, but I'll do it again! My oldest didn't want to stay home alone. My youngest couldn't wait to stay home instead of tagging along on carpools. I think it was at about 9 or 10 years old. It still feels odd to leave them home for long periods of time, though. A great post, will be saving this for when Dino is older! I wonder if Dino will like staying home alone? Thanks Janine! I saw your post about Emma being sick - hope she feels better very soon! Thanks, Kathy, for your support and encouragement! Yeah, I can't imagine leaving them for several hours - doing it for just one hour felt weird enough! Thanks for weighing in! I actually joke that if I were to leave my kids alone for hours, they'd be fine. Yes, even the two-year-old. It's a joke, but if this is something I can joke about now, I wonder if they'll grow up to earn my trust easily. I think I was about 11 or 12. I had older siblings, though. So maybe they left me with them first. I wish I remembered more! I was babysitting by age 11 or 12, so someone was leaving me alone! This is such a great topic to talk about Lisa! I know people that leave their kids home at as early an age as second grade!!! I have only left my kids alone a few times and for a few minutes. My oldest (11) I have left alone for longer- but she is uncomfortable and she doesn't have a phone, so I don't feel right about that at all. If we had a phone line at home, perhaps I would feel a bit more easy going. It really does depend on the kids- and I love the advice and information you shared here!! Ha! If I left my three home alone together, it would be WWIII! I think I was baby-sitting around 12 as well. Nice information. My son is 12 and stays home alone. But only for about 2 hours. He know show to reach us in case. I think I remember starting to stay alone at around 11? Thanks, Lisa! Glad it was helpful! My kids don't have a key to get in either. And, you know, I never thought about talking to them about what to do if, heaven forbid, we didn't come home when they were expecting us. So much to think about! This is fantastic, Lisa. I had a VERY heated conversation about this on my blog's FB page when I innocently asked this question a few months ago. With my oldest being 8, the topic had really never occurred to me, as I figured we had years before we'd even consider it. I had no idea people had such strong opinions about it! This is truly practical and helpful- nicely done! Thanks Stephanie! I expected a little more heat in the FB conversations, but most of the people who responded to me had fairly similar opinions. Just not something I have really ever seen addressed in a blog post or article. I was babysitting multiple kids when I was only 12, for hours at a time. When I was 14, a mom left me with her three kids, one of whom was 2 weeks old! My kids first stay home alone when they are 11 or so. It's a rare day that a child is alone, though. There's almost always at least 2 big kids home at a time. Each child is different, and their ability to babysit the younger kids is different. They don't stay home unless they are ready and willing, and they don't watch the little kids until they are responsible enough and resourceful enough to do so. Right! They eventually do get to stay home alone, don't they. It's so weird to think I was staying home by myself when I was 10 and then a nanny for two kids over the summer at the age of 13. I think the biggest indicator is the child themselves - are they mature enough to handle it. Thanks for sharing. This was so thought-provoking! I think it's important to consider who else is at home. I am comfortable leaving my 12 year old alone, but not leaving her in charge of her two sisters yet. Thanks, Jennifer! Definitely depends on the individual children - and what the parents are comfortable doing! Wow, I just realized we don't have a law about this at all! I think I would comfortable leaving my son at home alobe when he turns 12. Or 13. I actually haven't thought of this yet since my eldest is 9. My oldest is 12 going on 20 :-) and she had been asking. One reason I decided to do the research!